For kids, turning 10 and entering the double digits is a major milestone, so the 10th birthday wishes you pick for a 10-year-old birthday boy or girl should be milestone worthy. What's milestone worthy? Generally, anything that makes your average 10 year old feel less like a child and more like a teenager. Plus, you should choose 10th birthday greetings that make Mom and Dad happy, too! For specific helpful hints on selecting the right birthday wishes for the birthday girl or boy, check out Message Guy Tip #92 below. ...You should not include anything that remotely suggests that the 10-year-old birthday boy or girl is still a child — because, I can assure you, that he or she is not a child at all. Your average 10 year old is what advertisers refer to as tweeners" (primarily children aged 9 to 12 who fall somewhere between "little kid" and "teenager"). The "tweeniest " boys and girls are aged 10 to 12. That's because, as South Australia's Women's and Children's Health Network argues, "from 10 to 12 years of age, children start to move from childhood to a view of a more adult world that they will clearly want, or be forced to join, in the near future. They are "searching for identity," so an inspirational birthday message that focuses on their best qualities would go a long way with them. They are "seeking more independence and might want more responsibility (and may want to spend less time with family and more time with friends and peers)," so, once again, an inspirational birthday message would be the way to go, but this one should focus on their growing independence in a very positive light (so no jokes about this milestone). They are "likely to be more self-conscious, especially about their physical appearance and changes," so a happy or sentimental birthday greeting that praises what you like about their appearance would be most welcome (if you can't find anything nice to say about their appearance, don't take this route because they can smell a lie a mile away). They are "showing strong feelings and intense emotions at different times," so a funny birthday message that pokes fun at some aspect of their appearance or personality is clearly not a good idea for these overly sensitive tweens. They are "seeking out new experiences and are engaging in more risk-taking behavior, yet are likely to be thinking more about 'right' and 'wrong' (and are starting to develop a stronger individual set of values and morals)," so an inspirational birthday verse with a subtle message that could build their moral fiber might do the trick here ("trick" because you need to pick a birthday wish that can camouflage this message). They are "influenced more by friends, especially when it comes to behavior, sense of self and self-esteem," so a sentimental birthday wish about the importance of their friendships would be the right path. When all is said and done, you'll need 10th birthday wishes that aren't babyish in nature, since treating a 10 year old like a child is slightly patronizing for them (and you won't get the reaction you want, which is to make them feel special). The tweener-oriented 10th birthday wishes aren't patronizing at all, giving you ample opportunity to actually coax a smile out of your 10-year-old birthday boy or girl. Happy 10th birthday! Congratulations, today is your first double-digit birthday. You are officially a teenager in training! You're beginning to look much, much more grownup and, if I may add, much, much more distinguished. Happy 10th birthday! 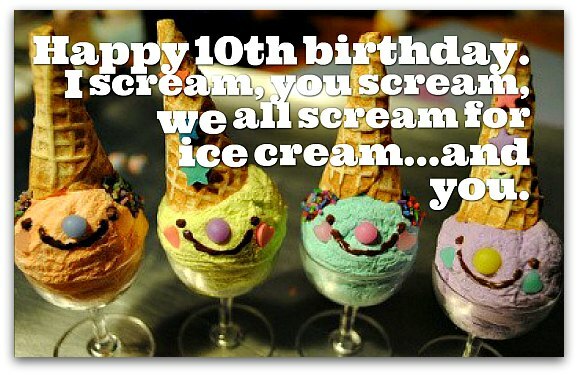 May all your 10th birthday wishes come true today, starting with plenty of birthday cake and ice cream. You're 10 today, so it's time to think about your future! Just kidding! The only thing you should do now is have fun, fun, fun and fun! Happy 10th birthday! Happy 10th birthday! Welcome to the double digits. You're not a one-digit kid anymore. Happy birthday to the world's (no, the universe's) greatest 10 year old! May your 10th birthday be as wonderful as the seven wonders of the world. That's pretty wonderful (like you've always been to us)! The greatest time of your life is here. You are 10, so it's time to be great...and have a great time. Happy 10th birthday to you! We definitely cannot call you a "little kid" anymore. You are now in the double digits, so we should start calling call you a "teenager in training" today ! Happy 10th birthday! Happy 10th birthday! You've just finished your very first decade. This calls for a BIG celebration — because you're officially a BIG kid now. Blow out the 10 candles on your birthday cake and make 10 birthday wishes. After all, you're 10 today! Happy 10th birthday! When you turn TEN, you become Terrific, Extraordinary and Nice! Happy 10th birthday! The 10th birthday messages below blatantly tell the newly anointed 10 year old that turning 10 is a milestone as far as birthdays are concerned. In a subtle way, though, it also shows the birthday boy or girl what turning 10 means...you're really a big kid now and we need to start taking what you say and do a little more seriously. In other words, we have to give you more R-E-S-P-E-C-T. There's a new 10-year-old kid in town. You. Now that you're 10, you are a grownup in training. That means you deserve R-E-S-P-E-C-T, sooner rather than later. You definitely have ours. Happy 10th birthday! Happy 10th birthday! What a momentous day for you — you've officially joined the Double Digit Club. You're in the BIG leagues now. Bravo! Happy 10th birthday! Congrats on reaching the DOUBLE DIGITS. 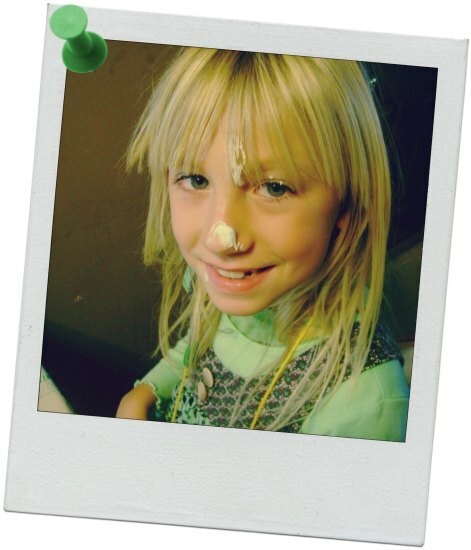 You will soon be a teenager, so we expect great things from you (and, gulp, maybe a few teenage pimples). Enjoy your 10th birthday to the fullest. That means getting the fullest you've ever been with lots of birthday cake and ice cream. Happy 10th birthday to an extraordinary kid who just got even more extraordinary today! Happy 10th birthday! Hooray, you're now 120 months old, but you don't look a day older than yesterday. Happy 10th birthday! Congratulations on reaching the first of your 10 double-digit birthdays! You have so many to look forward to. Happy 10th birthday! You're the best and, today, you're even better! We are so proud of you. You are a remarkable 10 year old. We love you so, so much. Happy 10th birthday! May you have the best of everything — from the best of friends to the best of love — now and always! Happy 10th birthday! WOW, you’re 10. You're not a teenager yet, but I guess you can call yourself a ten-ager. Happy 10th birthday! Happy 10th birthday! Starting today, you shouldn't be treated like a kid anymore. You're too much of a tweener for that. Happy 10th birthday! You deserve to be treated more like a grownup — because that's what you're beginning to look like to me. Happy 10th birthday. 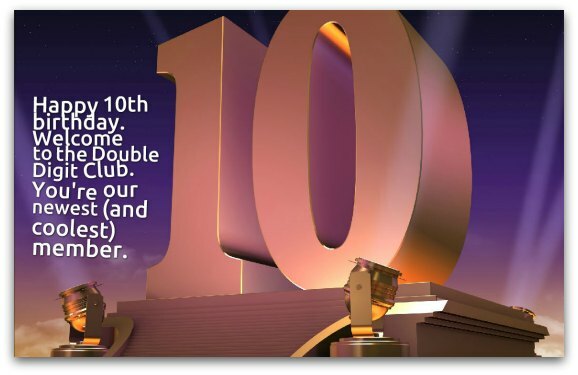 Welcome to the best club in the world: the Double Digit Club. Congratulations, you're our newest (and coolest) member. Happy 10th birthday. Just 10 years ago, you came into our lives and changed everything...for the better. Now, 10 years later, you're changing every day...making our lives better than ever. Happy birthday! Yes, you're 10 today. Sure, you're no longer a little kid. But you're never too old for a birthday hug and kiss. Come here and get yours — you deserve it! Turning 10 is a major milestone— not just because it's your first double-digit birthday, but also because it's the first year you can honestly and proudly call yourself a BIG KID. Happy 10th birthday. As you embark on the greatest adventure of your life — the double digits — remember to do one thing: enjoy every second. Happy 10th birthday! Bravo on turning one decade old! I realize it sounds old, but that only makes you 10 and means you have 10 birthday wishes to make. Hope each one comes true! Happy 10th birthday! Hope your party is incredible in every way, with lots of birthday cake, ice cream, gifts and, most of all, fun. Hope your 10th birthday is unforgettably wonderful — just like you! May you receive only the best birthday gifts. Enjoy each and every one! Happy 10th birthday! At 10, you're no longer a child. Now you're a teen in training. You are so grownup! Happy 10th birthday! It's great to be 10. You’re not a kid anymore and you’re not a grownup. You're, well, simply perfect. Happy 10th birthday! Happy birthday. Wow, you've just turned 120 months. You don't look a day over 119 months and 364 days! Only yesterday you were a cool single-digit kid. Now, a day later, you're a double-digit kid and double as cool. Happy 10th birthday. Hooray for hitting the big “1-O” today. This is the first day of the rest of your double-digit life. Start enjoying it right now—on the double!